- allergin: urushiol containing catechols humans: allergic reaction causing dermatitis, blisters (many humans develop symptoms after only one exposure); sap contaminates clothing, tools, etc. compounds are chemicals involved in basic metabolism , whereas secondary compounds are chemicals that are generally waste products of metabolism. Secondary plant compounds, the toxic substances, have coevolved in higher plants in response to attack by herbivorous insects for over one hundred million years. Animals are poisoned when the animals' protection mechanisms (detoxification) are inadequate. Secondary compounds include chemicals such as alkaloids, glycosides, oxalates, saponins, tannins, and toxalbumins. These chemicals are toxic in various ways to vertebrates. Some responses are dramatic (violent spasms, death) or subtle (reduced weight gain, birth defects). Other chemicals are only toxic after being altered inside the animal body (for example, cyanogenic glycosides, which produce cyanide) or if the animal is exposed to the sun (photosensitization). Researchers continue to discover new toxins from plants. In 1986 it was estimated that poisoning of cattle, sheep, and horses grazing western U.S. rangelands cost ranchers $190 million per year. Most cases of human poisoning involve house and garden plants. In 1998 there were 122,578 plant-related calls to poison control centers in the United States, according to information from the American Association of Poison Control Centers. Only 109 of those cases were serious (but included four fatalities). Some cases of plant poisoning are remarkable. During the nineteenth century tragic loss of human life occurred from a mysterious milk sickness in which cattle ingested white snakeroot and a toxin was passed on to humans through the milk. In 1971 near Garrison, Utah, more than twelve hundred sheep died after ingesting the rangeland plant halogeton. Although these toxic compounds are harmful to most species that ingest them, some insects are not harmed by some of the toxins and actually sequester the poison in their own body as a defense against their own predators. Keeler, Richard F., Kent R. Van Kampen, and Lynn F. James, eds. 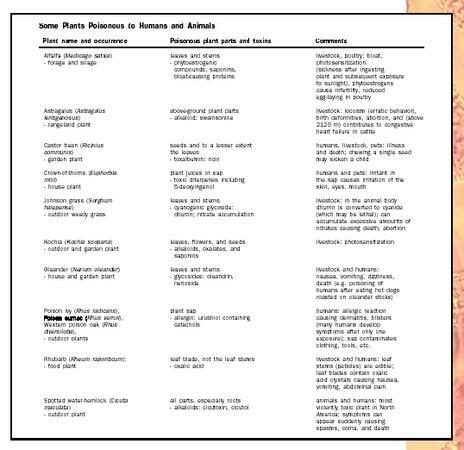 Effects of Poisonous Plants on Livestock. New York: Academic Press, 1978. Munro, Derek B. Canadian Poisonous Plants Information System. <http://sis.agr.gc.ca/poison/> . Agriculture and Agri-Food Canada, 1993. Spoerke, David G., and Susan C. Smolinske. Toxicity of Houseplants. Boca Raton, FL: CRC Press, 1990. When white snakeroot is eaten by livestock, it can cause a sickness known as trembles. Symptoms in animals include depression, inactivity, labored breathing, loss of weight, and trembling. I have been feeding lucerne (alfalfa) to my poultry for 10 years without any " livestock, poultry: bloat, photosensitization (sickness after ingesting plant and subsequent exposure to sunlight), phytoestrogens cause infertility, reduced egg-laying in poultry" problems. I have also eaten sprouted alfalfa without any side affects.